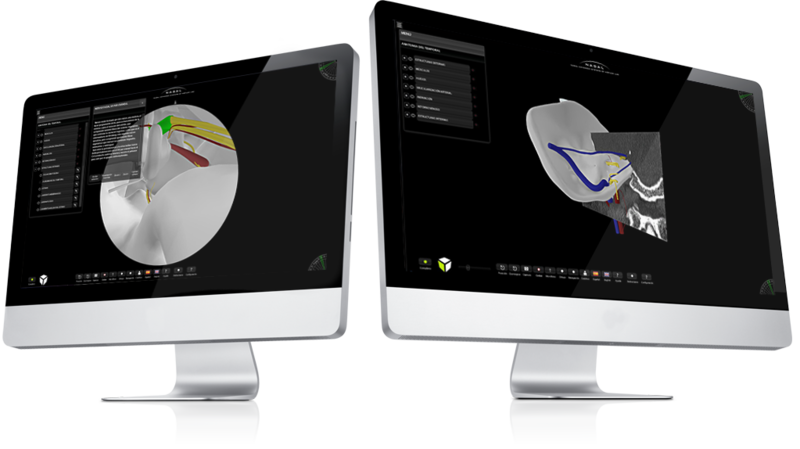 3D Nasal Vista 2.0 is a desktop application that allows a three-dimensional visualization of the temporal bone, middle and inner ear, providing a detailed anatomical knowledge of the complex structures that compose them. Its visual capability allows the user to have a new experience in the anatomical identification of the different elements, as well as being able to interact with the model from all possible angles. This app allows the simultaneous visualization of the 3 projections generated by the CAT scan, on which we have based our 3D model, allowing hence, a perfect correlation of the anatomical structures with the radiological images, an entity of invaluable utility in the physicians’ daily practice. The program offers a new visualization option simulating an endoscopic view of the middle ear, offering a highly valuable visual training of great utility in endoscopic surgical practice. The new visualization options allow the transparency of anatomical groups for a better of the anatomical structures beyond the different bones, providing an innovative visualization for a better understanding of the surgical anatomy. This software allows to make snapshots, audio and video recording of navigation and anatomical reference made, very useful in training. Explain surgical approaches and make videos for the social media channel of the medical professional. Next a small demonstration of some of the options and possibilities for 3D Nasal Vista Temporal. From descriptions of all internal anatomical structures of temporal bone, middle and inner ear to different display types, the most important being the endoscopic visualization.